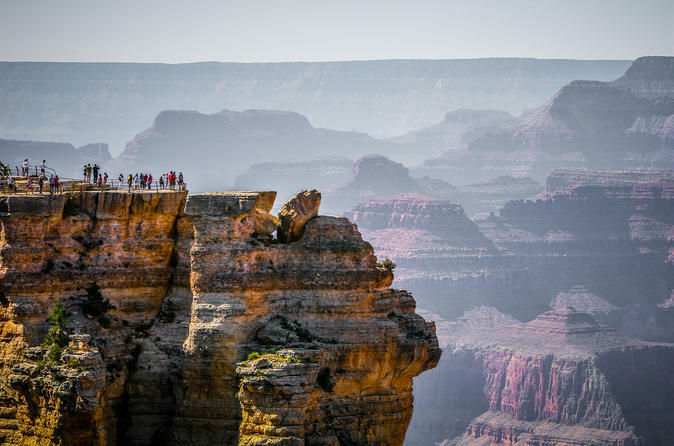 Experience Grand Canyon National Park on a day tour with options for a Historic Railway Trip, a helicopter tour over the canyon or a guided bicycle tour along the rim. This tour offers 3 hours in the National Park and includes transportation from the Las Vegas Strip with a morning snack, bottled water, lunch and park admission fees. Enjoy the Grand Canyon’s South Rim with the most time at the canyon, the earliest return, and the shortest overall duration. Add options like a Historic Railway trip into the canyon, Helicopter Tour or a bicycle tour. Depart from the Las Vegas Strip in a deluxe motor coach, with WiFI. Today's route travels through the Mojave Desert, the famous Mike O’Callaghan-Pat Tillman Memorial Bridge, and cross iconic Route 66. Today offers a dramatic scenery change as you gain 5000 feet of elevation from Las Vegas. Desert plants and animals change to scenery and wildlife from the Colorado Rockies, with 100 foot tall pines, giant elk and mule deer. Once you arrive in Grand Canyon National Park, you’ll have 3 hours to explore the deepest and widest part of the canyon, the South Rim. When you get off the bus, your driver will set up the picnic lunch (provided by the tour) which you can enjoy while taking in the views. The main points at the National Park are Grand Canyon Village and the Visitor Center/Mather Point with access to popular Canyon rim viewpoints, trails, and attractions. Explore the area by walking along the rim in Grand Canyon Village – and poke around the shops, visit the many lookout points for great views, and more. Popular attractions in the Grand Canyon National Park include El Tovar, Hopi House, Kolb Photo Studio, and the Bright Angel Trail – your driver will fill you in on all the details about what you can do and see.